The most important thing in the life is the sense of security, especially when it comes to their home and families. Keeping that in mind we would like to give you an informative article on the Amcrest 1080p HD Security Camera System, so that you get to know a little bit more about this state of the art security system. Arguably the most important feature of any security camera in the market right now is the video quality of the camera. And when we talk about this system then it must be said that thanks to 1080p HD feature of the cameras they do give good video. In terms of clarity, it is pretty top notch, with crisp image you will be able to view any video feed with conviction. The advantage that you will get here is that you will be to differentiate between objects clearly, meaning that you can give attention to detail, something that is missing in many cameras. In order to prevent any lag in the feed they have created the system in such a way that there the four concurrent feeds that are uncompressed will converge into the all important DVR. This is one DVR that can truly handle a lot of traffic and that is the reason you will be able to uninterrupted images all round the day. There is no doubt that you might be asking us as to do all these memories get stored and do they get deleted by themselves. Let us tell you that when you get the product, then you will have a 2TB HDD which will accompany it, in short you really don’t need to worry about the memory here. We do understand that the system has four cameras which will be responsible for surveillance, but it is the power of the memory that it can handle all the footage coming into it from all the cameras effortlessly. It has the capacity to store footage close to 360 hours or 15 days at a go without a glitch. If you are still not satisfied then with the help of some changes in the settings especially by lowering the resolution or manipulating the motion detection feature, you can have uninterrupted image for over 50 days, and the best thing is that you will still be left with storage space. Moreover if you set the DVR in a certain way then it will know when to overwrite the footage previous date by sorting which one is the oldest. Another way to keep the video flow going all the while saving memory space is by keep a back up of the video in either an external hard drive or a USB. Here you will be able to not only keep a back up for the old feeds but will also free a lot of space, hence keeping all the footage that you need intact. The best way to keep your home safe is by getting a system that is capable of monitoring the surroundings of the house all day and night long, exactly what you are going to get with this system. When we talk about this camera then mentioning the bullet cameras become imperative. The reason for us saying so is that the 3.6 millimeters lens of the cameras are more than capable of catching each and every footage with real precision which is lacking in many cameras. Add to that the fact it has a 75” wide range. 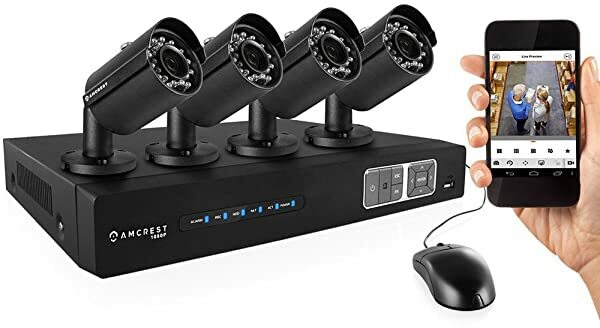 It means that if you are able to place the four cameras strategically then you will able to capture images all around the house with real ease. When it comes to night vision, then the IR LEDs of the security system is nothing short of a gift. With the capability of capturing images ranging up to 65 feet at night, this is one security system that will protect your house at the dead of night. Lastly, one feature of the camera that is really impressive is that when the cameras detect low light then the infra red mode is activated automatically, which makes sure that the video feed is relayed to the DVR without any issues. Motion detection ability: one of the many features that make it formidable is its ability to detect unwarranted motion. You will have the option of customizing it in such a way that it will be able to concentrate on a particular part with the option of scheduling as to when the features are to be activated. Moreover you will get a push notification and an email to alert you if the alarm is triggered. Weather proof bounty: made of heavy duty metal IP66, this is one security camera that can withstand any weather with ease. No matter if there is snow or strong winds or lashing rain; these cameras will brave all weather conditions to give you uninterrupted service. Option of viewing it from anywhere: a big advantage that you will get with this system is that you can view the footage of your house from anywhere, anytime. Given that the entire system is HTTPS encrypted, if you have a mobile device with internet browser then you can easily control the cameras and view any feed from such devices. The cumbersome wires: although the system is good, but it is not wireless. Therefore while set up of the system you need to manage the wires carefully, something that can be a little annoying and time consuming. The high pitch fan: some of the customers have said that the fans are louder than normal which is indeed something that needs to be taken care of as soon as possible. Sensitive detection: now complaining about the motion detection may not be right but we must say that they are a little too sensitive for comfort, something that the manufacturers should look at. The Amcrest 1080p HD Security Camera System is so vast and diverse that the features keep on coming and if we try to tell you everything in detail then it will never end. The point of the whole review was to educate you a little more about this particular system which has a potential to be an asset for you in terms of its security and safety measures. With how the world is now days, one can never be to careful about the overall security of their home or business. It’s worth investing as much money into protecting your property and making sure that it is always on lock down when your not there. 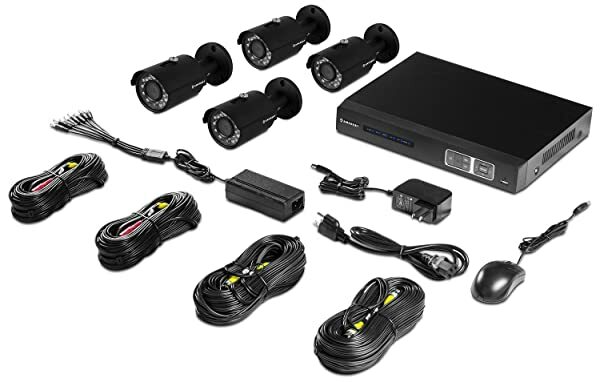 This is something that my wife and I are just learning about and we plan on finding a really good security system that involves cameras like the ones shown here. After using this system for a while, I must admit I am very disappointed in the quality of the image. I expected an extremely clear picture from a “full HD 1080p” setup. I have made all the adjustments as per the manual, but I still can’t read a license plate on a vehicle in my driveway right in front of the camera. And forget about zooming in. It is totally pixelated. Did I expecting too much? Are the cameras not capable of delivering a true HD image? If the cameras are not capable of “Full HD 1080p”, then the system should read Full HD 1080p CAPABLE”, if that is the problem. I wrote to Amcrest over a week ago and received no response. I researched this system before I bought it because it had wonderful reviews. Again, very disappointed. Amazing quality, for the price. The video comes out clear. Can’t ask for more. I think your system has problems. The product should be warranted. Better hope you never have trouble with this camera. AmCrest customer service and Tech support are horrendous!